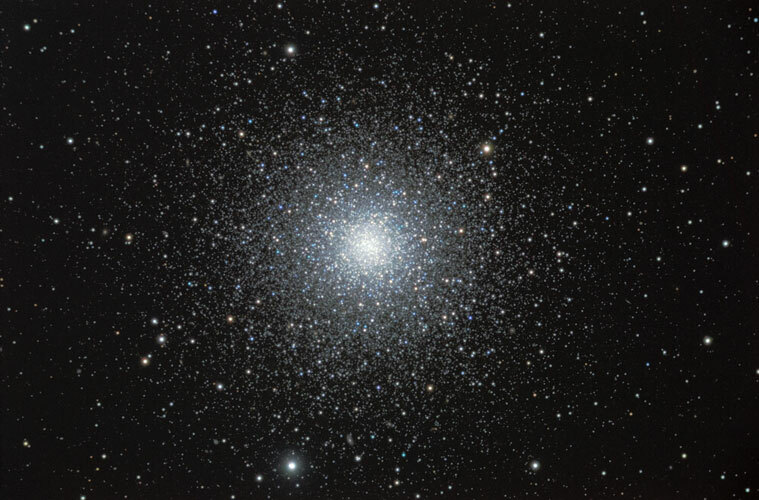 M3 is located at a distance of 33,900 light-years from our solar system, and is estimated to contain 500,000 stars. It contains a large number of bright, young blue stars known as "blue stragglers," some of which can be seen in this image. In the higher-resolution versions, at least 20 background galaxies can be identified. Technical Notes: Individual exposures were obtained using CCDAutoPilot2 and then sigma combined. The RGB image was created in Registar 1.0. A Gaussian Blur of 1 pixel was applied to the RGB image and Smart Sharpen of 1 pixel was applied to the luminance image. The RGB image was duplicated and combined with the original using Soft Light to enhance color.